Um, anyway… we’ve got some music to digest as well. And another cover version – this time going all the back to 1934 and George Gershwin‘s “folk opera”, Porgy and Bess. Not that long ago I suggested that Robert Burns‘ adaptation of “Auld Lang Syne” may be the biggest hit song of all time. But when it comes to songs that are still in copyright, “Summertime” really is the biggest hit of all time, at least in terms of the sheer number of recorded versions out there. Of course, it helps that there are plenty of recorded versions of Porgy and Bess, but there are also literally thousands upon thousands of standalone covers of “Summertime”. Its lyrical and musical evocation of a hot, lazy summer has proven irresistible to performers from all genres. 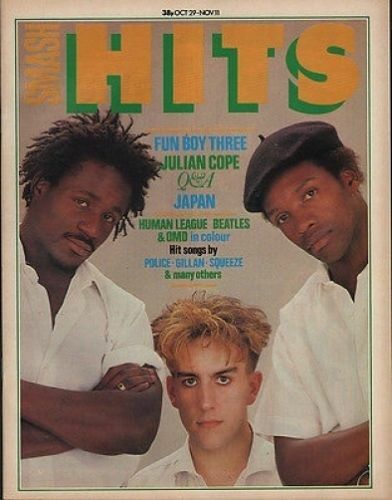 It’s not exactly an obvious match for The Fun Boy Three, though, so why did they do it? According to Terry Hall… “because Nicky liked it and came up with a nice classical arrangement for it”. Nicky? Aha, yes… Big changes were afoot for The Fun Boy Three. The first album’s minimal, percussion-based arrangements were partly born out of necessity. Of the three members, only Lynval Golding actually played an instrument, and at that stage they didn’t want to bring in a lot of session musicians. But for the second album they were striking out in a new direction, and the first step was to recruit… well, someone who knew what they were doing, basically. That someone was keyboard player, arranger, and new FB3 musical director Nicky Holland, formerly of The Ravishing Beauties with Virginia Astley. And that “classical arrangement” meant that for the first time, The Fun Boy Three were supported by a full band. Holland (keyboards and backing vocals) and Annie Whitehead (trombone) would go on to become part of the backing group for FB3’s second and final abum, while the single also benefitted from the talents of Caroline Verney (cello), Nick Parker (violin) and Frances Lynch (backing vocals). I suspect Holland is the unsung hero of The Fun Boy Three, phase two, but I don’t think she did them any favours by choosing “Summertime” as a song to cover. 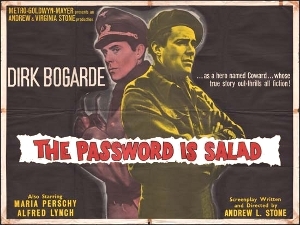 The reviews dismissed it as a throwaway (and worse), and to be honest, it is a bit dull. I mean, it’s pleasant enough – it would take a real effort to go badly wrong with “Summertime” – but it feels like a bit of a try-out. Because, well, it is. “Summertime” made the lower end of the top 20, as was becoming customary for FB3 singles, and really it deserved no more. 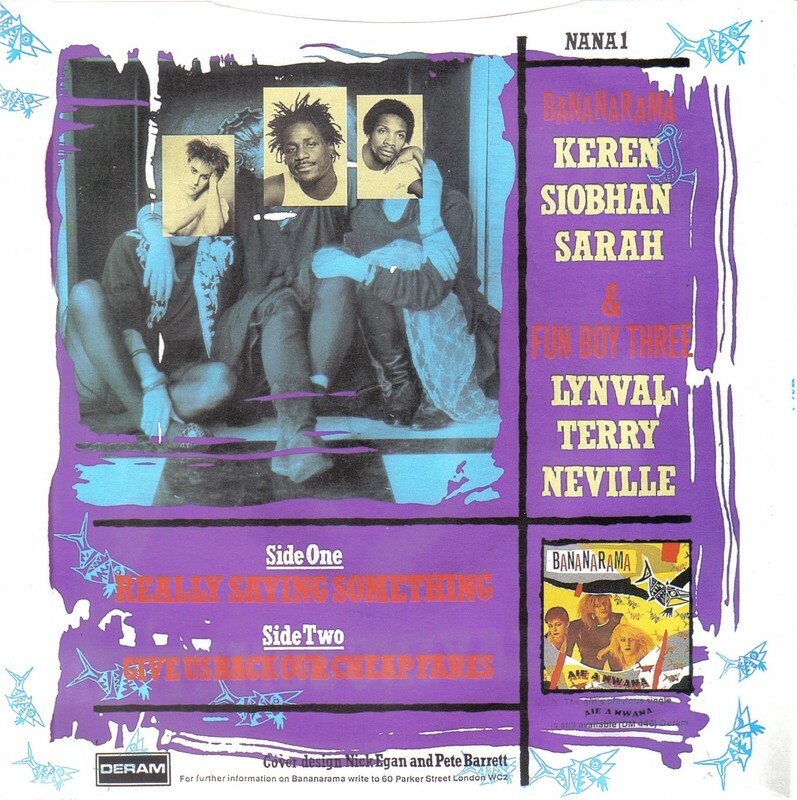 A look at the chart for the week that “Summertime” peaked at number 18 reveals many of the acts that Terry, Lynval and Nev could consider their peers – Madness of course, but also Dexys Midnight Runners (sitting proudly at number one with “Come On Eileen”, and soon to do the same in the USA), Bananarama, fellow ska-scenesters Bad Manners, and The Bodysnatchers spin-off The Belle Stars – all of them enjoying bigger hits than FB3 were. Next time: Pop and politics. That old chestnut. May 1982. Two top ten hits done and dusted. 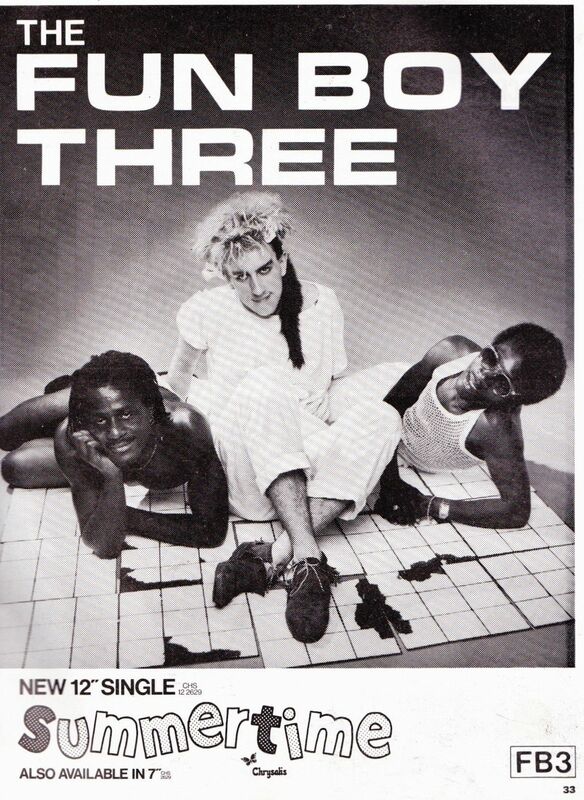 With Bananarama moving on, it was back to the day job for The Fun Boy Three. And rather oddly, back to ska. Even in its brassless album version, “The Telephone Always Rings” could easily be mistaken for The Specials. 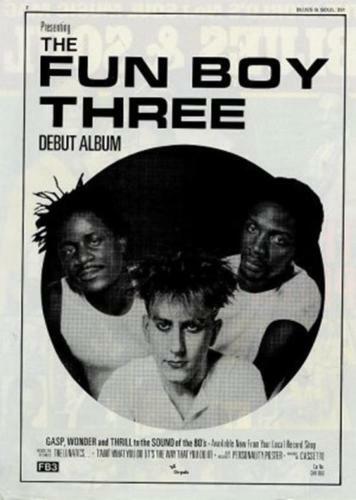 The album, The Fun Boy Three, had emerged back in March while “It Aint What You Do It’s The Way That You Do It” had been riding high in the charts. It arrived to mixed reviews; those who thought “The Lunatics (Have Taken Over The Asylum)” was a one-off experiment and were expecting a poppier album would be disappointed; the LP as a whole skewed toward the darkness and the drum-heavy style of the debut single and then took it even further. It was a bold statement and a distinctively different album but you wouldn’t say it was packed with potential singles. Maybe the extreme minimalism of “Life In General (Lewe In Algemeen)” (drums, vocals and nothing else) could have been a hit – it would certainly have caught radio listeners’ attention, assuming it got played in the first place – but really there was only one choice. If “The Lunatics” had been a bit of a scream against the world in general, “The Telephone Always Rings” was a rather more mundane moan about how the life of a popstar isn’t all it’s cracked up to be. 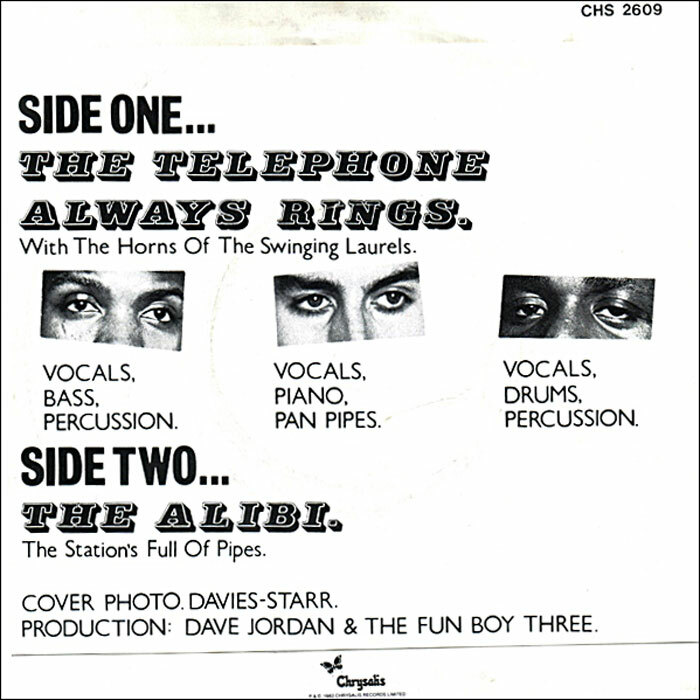 Musically, “The Telephone Always Rings” was a bit of a throwback to The Specials – which may well have been deliberate, considering that lyrically it saw the Fun Boys’ dissatisfaction with life in their old group bubble to the surface. Perhaps it was a bit of a send-up, as well as a signal that they could still do the ska thing as well as their old group – when they chose to. Anyhow, Leicester group The Swinging Laurels (not to be confused with Coventry band The Swinging Cats, two of whose number would later join Terry Hall in The Colourfield) added brass, and appeared with The Fun Boy Three to promote the record on Top Of The Pops and other shows. Also on the single was a rather fun non-album B-side, “The Alibi”, with a railway rhythm, an intriguing if minimal lyric, and some scatting that may have been intended for Bananarama to sing. Both songs drifted into extended dub sections on their respective 12″ mixes. Next time: Smiles all round! No, really. 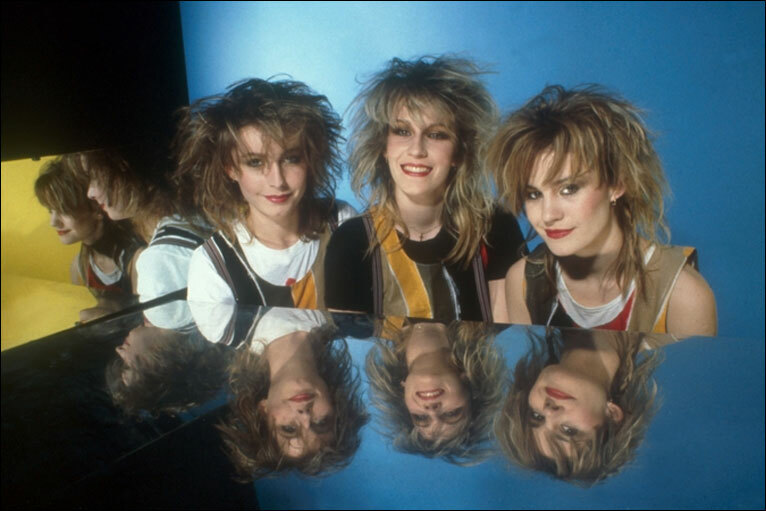 The very week that “It Aint What You Do…” dropped out of the top 40, a new collaboration between Bananarama and the Fun Boy Three entered. This time, FB3 were the guests, and their vocals were less evident, though their production was front and centre. In contrast to “It Ain’t What You Do” – a jazz song successfully wrenched away from its natural idiom – “Really Saying Something” was a girl group song from the start. Composed by Motown in-house songwriters Norman Whitfield, Eddie Holland and William Stevenson in 1964, it was a minor US hit for The Velvelettes (whose name seems calculated to make you think you’ve mistyped every time – or is that just me?) early the following year. Perhaps surprisingly, it never broke through in the UK, though both it and their other US hit “Needle In A Haystack” later found favour on the Northern Soul scene. That scene was presumably also responsible for giving them their only UK chart entry when “These Things Will Make Me Love You” belatedly hit the lower end of the Top 50 in 1971, some years after the group had retired. You wouldn’t think they owned a mirror, would you? Of course this is a Bananarama showcase, but underpinned by FB3’s hallmark drums. There’s not a lot to say about this, really, but it did give the collaboration a second top ten hit. 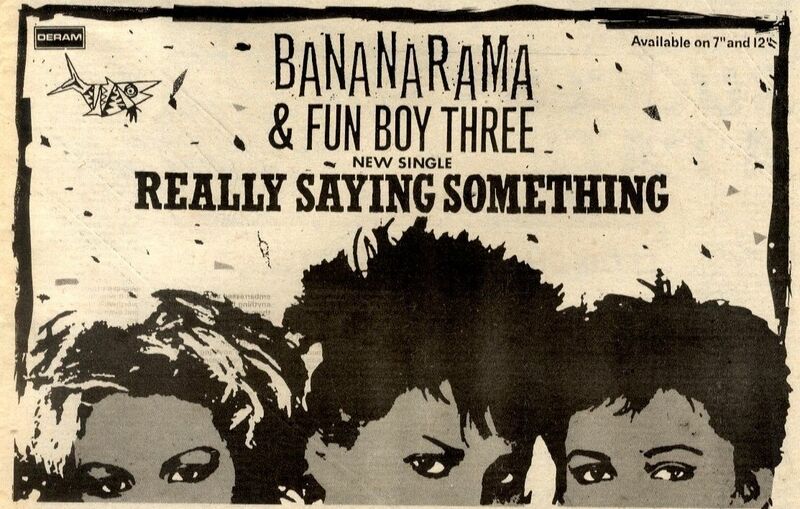 Being more of a Bananarama single, it was a surprising choice for inclusion on the first career-spanning compilation of Terry Hall‘s work, Through The Years, especially as “It Aint What You Do…” wasn’t included. Though it was a more obvious choice than “Nelson Mandela” by The Special A.K.A., which Hall wasn’t involved in any way, and which led to the album being quietly deleted after its first pressing. The near-instrumental B-side is more recognisably Fun Boy Three-ish. They don’t get writing credits (Bananarama are listed alongside former Department S frontman Vaughan Toulouse) but as producers their mark is all over it. Not being a “proper” FB3 track, and rather weird for Bananarama, it didn’t get issued on CD for a very long time, but is now included on the deluxe edition of the Deep Sea Skiving album. I much prefer it to “The Funrama Theme”. Note the plug for previous flop “Aie A Mwana”. They hadn’t given up on it! 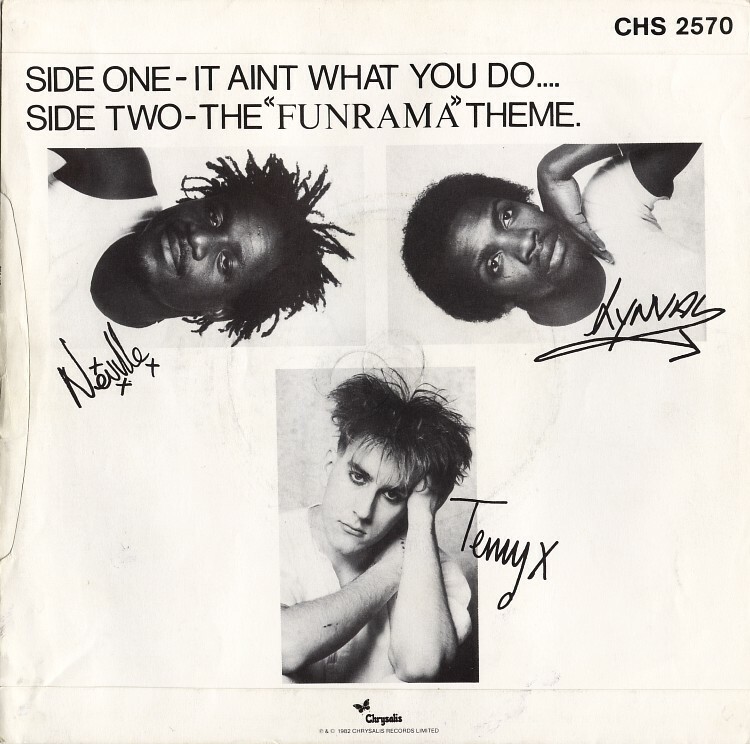 “It Aint What You Do It’s The Way That You Do It” is The Fun Boy Three’s biggest and probably most recognised hit. Its breezy xylophone riff and title refrain have put it up there with “I Got You (I Feel Good)” as an overused advertising staple, deployed to promote cars, printers, a hardware store, at least two different supermarkets and no doubt various other things as well. And while Messrs Golding, Hall and Staple may not personally approve, or necessarily approve of, these ads, I’m sure the remuneration is very welcome. What they don’t get, though, is a cut of the songwriting royalties, since it was written before any of them were born. It wasn’t the first time that Golding, Hall and Staple had updated a jazz standard; the Specials’ second album More Specials had opened and closed with a ska’d-up version of the 1949 composition “Enjoy Yourself (It’s Later Than You Think)”. “T’aint What You Do…” (as the jazz folk normally called it – the first pressing of this single also used “T’aint” on the label) was even older, being penned in 1939 by Sy Oliver and James “Trummy” Young, then members of Jimmy Lunceford‘s band. Lunceford made a popular recording of it that year, as did Ella Fitzgerald, whose version included an extra verse, seemingly unique to her. 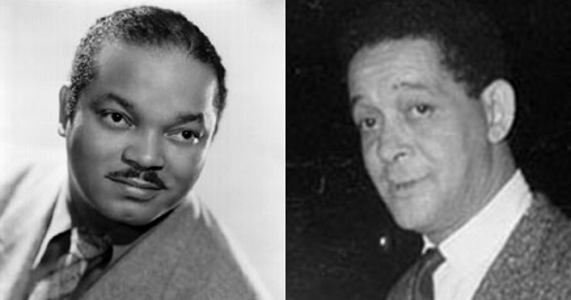 YouTube offers up a wealth of covers by the likes of Fats Waller, Adelaide Hall, Louis Armstrong, Julie London, and Cleo Laine, all of whom stick to the Lunceford-endorsed lyric. FB3 don’t quite stick to the traditional lyric. Strangely, they drop the standard introductory verse (“When I was a kid, about half past three / My daddy said son, come here to me / Said things may come, and things may go / But this is one thing you ought to know”), though they do include what I think is a new verse of their own (“I thought I was smart but I soon found out / I didn’t know what life was all about / But then I learnt, I must confess / That life is like a game of chess”). But let’s face it, this number is all about the chorus, which repeats in several variations: It ain’t what you do, it’s the way that you do it, the place that you do it, the time that you do it… that’s what gets results. And it really is the way that they did it, that got results here. It’s quite a challenge to make something new out of a song with four decades’ worth of covers already behind it, especially a song that doesn’t have a lot to it in the first place, but FB3’s arrangement is a triumph. Bear in mind that “T’aint What You Do…” is traditionally a song that showcases a horn section – it was, after all, penned by a trumpet player and a trombonist. 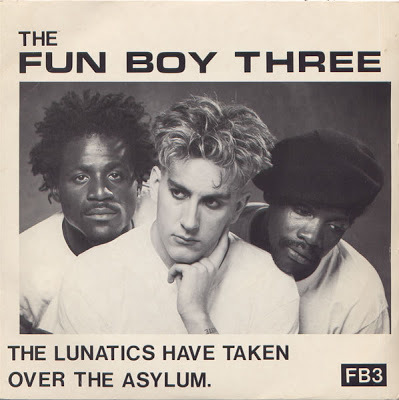 The Fun Boy Three’s emphasis on percussion, and the complete absence of brass in their version, makes their arrangement quite different to the way the song would normally be performed. It’s respectful to the song yet also fresh; a real achievement. And it’s not even their best single! But why Bananarama? According to Terry Hall, because “they’re three girls, and they don’t know what they’re doing either”. Fair enough. In truth, it wasn’t quite as strange a team-up as it might appear in retrospect. 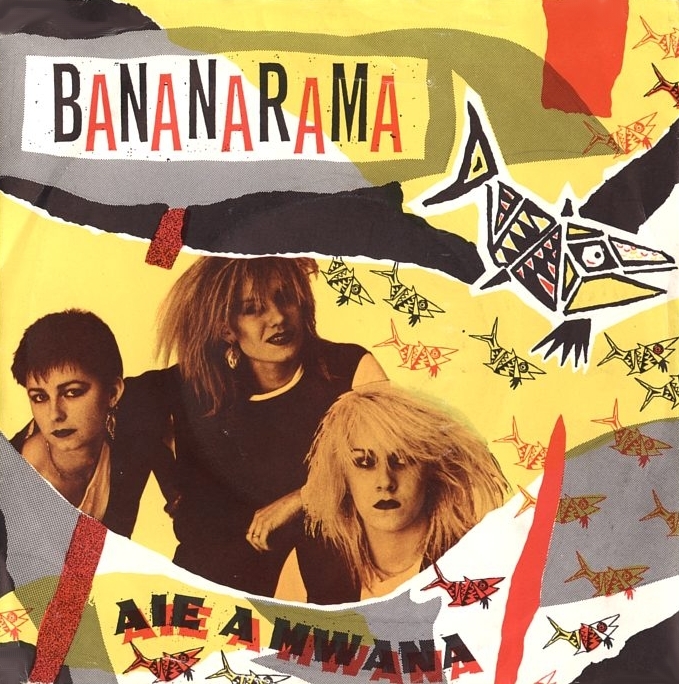 Nowadays we know Bananarama as purveyors of slick production-line pop, but at the time their only recorded output (other than backing vocals on a Department S B-side) had been a flop independent single covering a faux-African disco track and sung entirely in Swahili. And they didn’t smile on the cover. It wasn’t that much of a leap to see them having something in common with the creators of “The Lunatics (Have Taken Over The Asylum)”. 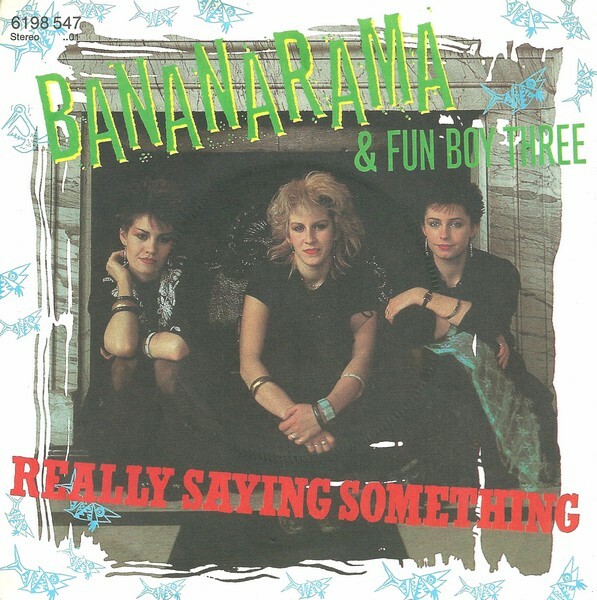 Bananarama’s contribution is absolutely key – maybe the Fun Boys could have performed the title refrain themselves (although counting against them is the lack of conviction in their delivery of “then your jive will swing”) but it took female voices to do the “doo-do-loo-doo-doo”s, and to contrast with FB3 in the lengthy vocal breakdown that begins about a minute in. In both of these things they are essentially standing in for the absent brass; it works so well that you never question it. The single reached number 4 in March 1982. Co-incidentally (well, I assume it was a co-incidence! ), the number one that week was also a revival – albeit via a somewhat more complex lineage – of a song first recorded in 1939: Tight Fit’s version of “The Lion Sleeps Tonight”. FB3’s single is a bit classier (well alright, quite a lot classier), although I’m sure a lot of people must have bought both. At this point we have a blip in the Fun Boy Three singles series. 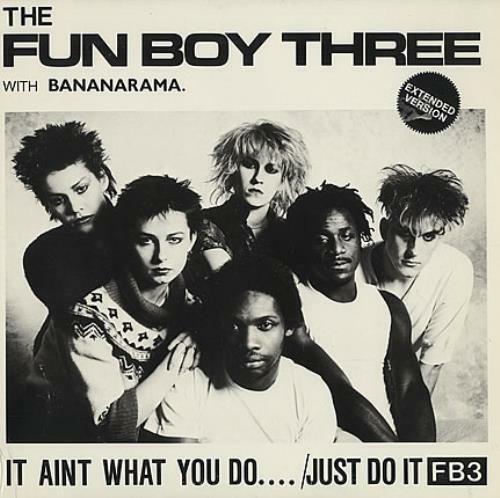 The collaboration with Bananarama was so successful that not only did Keren, Sara and Siobhan also guest on two more tracks on the Fun Boys’ LP, but FB3 were brought in to lend a hand with the next Bananarama single. Instead of dealing with that in a bonus post at the end of the series, it’s going to appear here in its proper chronological position, next week. 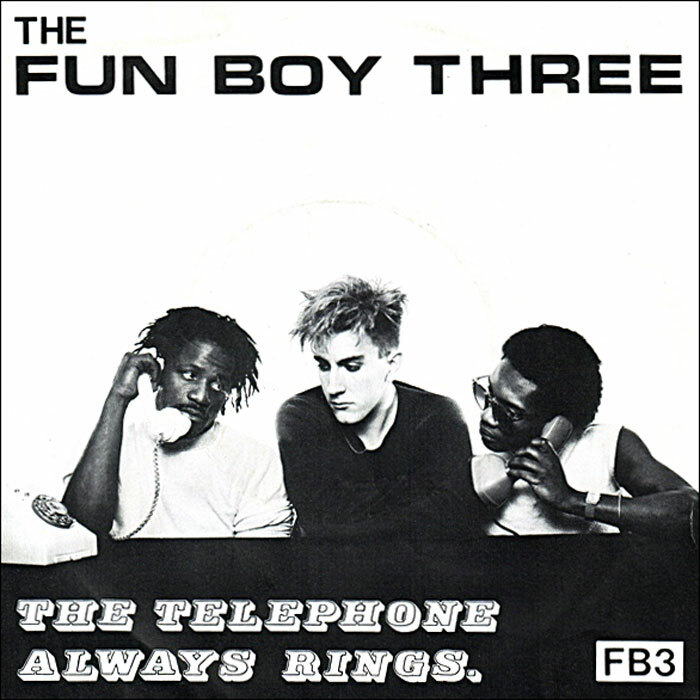 Presenting the first part of a series featuring the singles of The Fun Boy Three. The trio who split from The Specials in the summer of 1981 might never have achieved quite the same critical or popular success as their previous band, but they did produce a solid, if small, body of work that’s worth celebrating. Hence this series. Of course, the story of The Fun Boy Three starts with The Specials, the seven-piece Coventry-based group whose politicised, post-punk take on ska brought them a string of hits starting with “Gangsters” in the summer of 1979, and culminating with the three-week chart-topper “Ghost Town” two years later. And then out of the blue, they split. 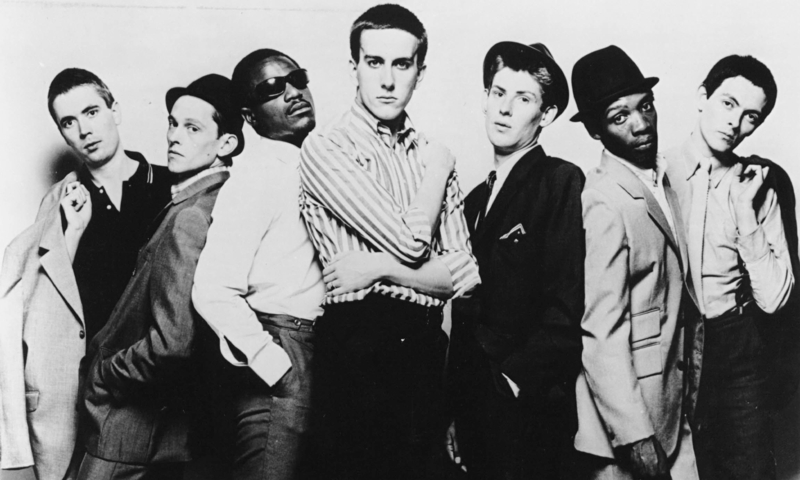 Though they denied personal tensions with the other members of the group, it was no secret that vocalists Lynval Golding, Terry Hall and Neville Staple had grown dissatisfied with the musical direction and working methods of leader Jerry Dammers. It wasn’t just that they wanted more creative input – even more fundamentally, they just wanted to get on with it. 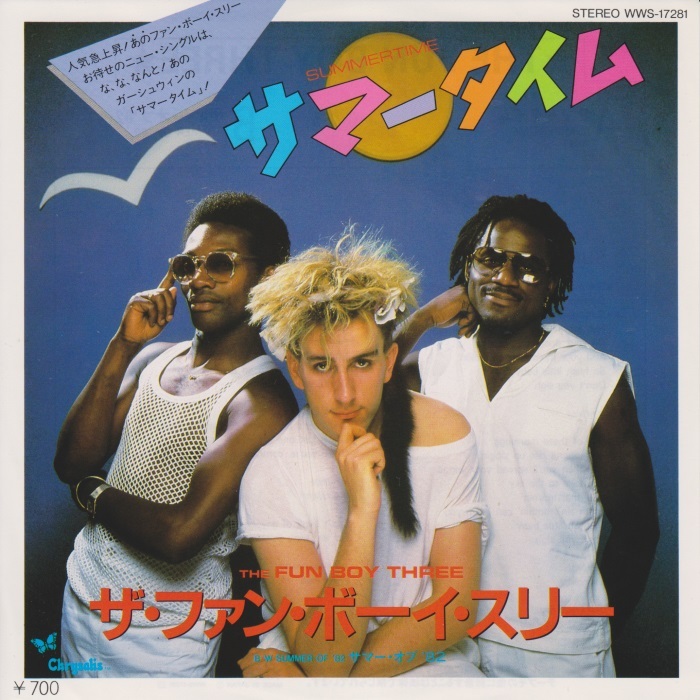 Following the second album, Dammers had the band take a six-month break to write new material, but the soon-to-be Fun Boy Three didn’t have the patience for that; they preferred to hit the studio and create as they went along. So that’s what they did – and they took Dave Jordan, who had produced the second Specials album More Specials, in with them. In view of which, one wonders at what point it became a new project rather than demos for The Specials. In any case, by the time “Ghost Town” hit the top of the charts, they had a debut single ready to go. 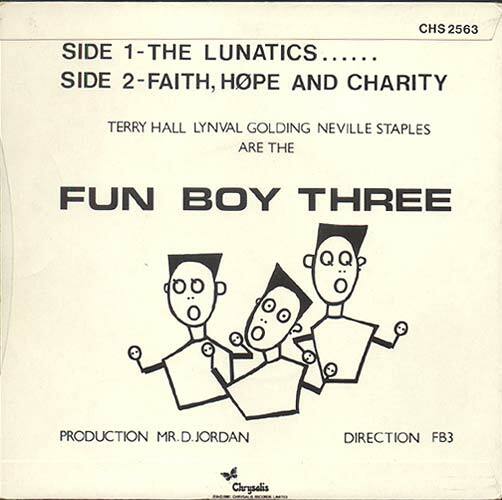 The Fun Boy Three split from the group, and indeed from the 2 Tone label, signing directly to parent label Chrysalis. 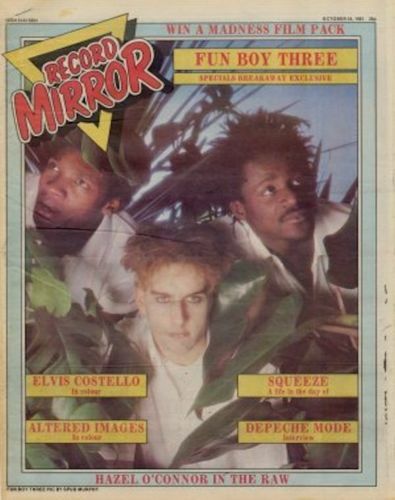 Their instincts about Jerry Dammers were right, incidentally: left to his own devices, he took so long over the next Special AKA album, In The Studio, that by the time it came out, The Fun Boy Three had already released two albums and split up! Meanwhile, the B side was a rather strange, synth-driven track which went down surprisingly well with the alternative dance crowd. Both tracks later appeared, unaltered, on the debut album. “The Lunatics” reached a chart peak of number 20, which doesn’t sound too bad, but must have been something of a disappointment given that before the split, every one of the Specials’ seven singles had made the top ten. Join me next Tuesday for part two of this series, in which The Fun Boy Three actually have some fun!